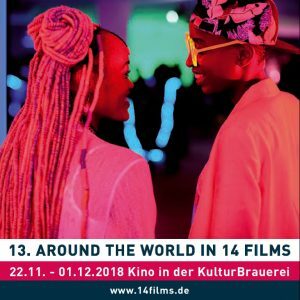 AROUND THE WORLD IN 14 FILMS is an independent international film festival that every year brings 14 extraordinary films from 14 regions around the world, to show and share with Berlin’s discerning cinema public. From South America to Africa, through different parts of Europe to the Near East, through the Middle East and Central Asia to parts of the Far East, and on to North and Central America: 14 films representing 14 different, personal, artistic visions of 14 areas of the world. Each of the 14 films will be presented by another leading German director, actor, artist or journalist, who will introduce both the film and the directress/director (if she/he is in attendance), and then moderate a discussion with the audience and the directress/director immediately after the film. Among the guests from all over the world who have personally presented their films are: Emin Alper, Sean Baker, Olivier Assayas, Nuri Bilge Ceylan, Geraldine Chaplin, Asghar Farhadi, Sophie Fiennes, Cristina Gallego, Miguel Gomes, Ciro Guerra, Joanna Hogg, Alejandro Jodorowsky, Otar Iosseliani, Radu Jude, Juho Kuosmanen, Yorgos Lanthimos, Nadav Lapid, Vincent Lindon, Sergej Loznitsa, Léa Mysius, Mohammad Rasoulof, Ben Russell, Kirill Serebrennikov, Ulrich Seidl, Albert Serra, Fien Troch, Apichatpong Weerasethakul, Andrey Zvyagintsev, and many more. Already shown and praised at various international film festivals such as Cannes, San Sebastián, Toronto, Sundance, Locarno and Venice, some of them yet still without German distribution, these films have been all but unavailable to audiences in Berlin. AROUND THE WORLD IN 14 FILMS will give Berliners the unique chance to discover, to discuss, to enjoy, to celebrate these new jewels of world cinema. Since 2018 Susanne Bieger and Bernhard Karl have shared the direction of the festival. For Independent cinema in a unique festival selection, from around the world, join us in 2019 at the Kino in der KulturBrauerei.